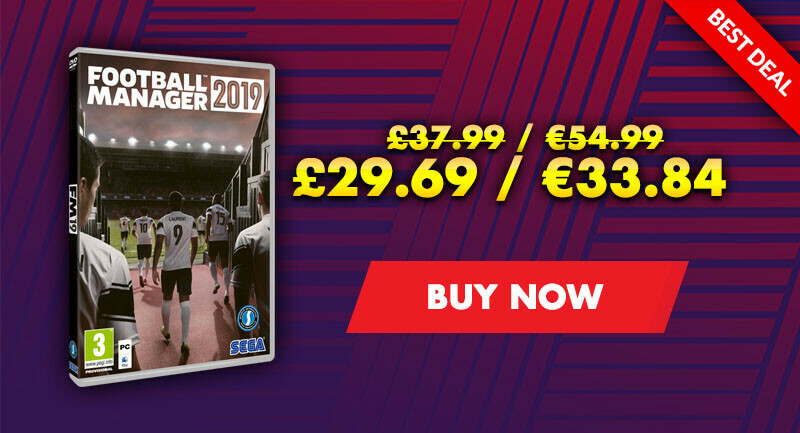 This article lists the top 10 loan signings I made, or wish I had made, over the course of the first couple of seasons - to save you hours of trawling through the Under 21’s of every team in the country, and the realisation of just how terrible your scouts are. We’ve all been there; we’ve conquered the world with our supported team, and fancy a challenge. For many of us, that challenge has often been taking a team from the lowest tier of English football, the Vanarama North/South, to the enchanted land of the football league and beyond. On previous editions, this has been relatively simple, but this year the SI team seem to have made everything slightly trickier. My goal was to take FC United of Manchester to the promised land, to rival the club whose shadow they were born from under. But it failed miserably, and within half a season I was out the door and lucky to get a job at Nuneaton, in the Vanarama North. I spent a couple of seasons with playoff heartbreak before finally conquering in my third season, and it would have been impossible without shrewd utilisation of the loan market. In 2014/15 he was a regular for the Cheltenham team relegated from League 2, but at the start of the game’s first season on my save he found himself surplus to requirements. Gloucester were lucky enough to pounce quickly, and they found themselves arguably the best loan signing I’ve ever come across. During his 26 games in the Vanarama North, he averaged 8.06 a game, notching up eight assists and 9 MOTM. While statistics are so often misleading, Hanks was that good. Deployed most effectively as a deep-lying playmaker, he is a real dead-ball specialist, creating a constant threat. He works hard out of possession and is a strong asset for teams who wish to win the ball back quickly. He may not become available on every save, but I cannot recommend him highly enough if he does. Sign. Him. Up. This young centre-back can also do a job as a defensive right back and is as solid as they come. He swiftly becomes a key part of the Coventry back four but is available during the first two seasons of the game. His physical attributes are superb; he tackles and heads solidly, marks and positions excellently, and consistently makes excellent decisions. He is a young talent who does lack leadership and unsurprisingly performed better when partnered with a more experienced, mature centre-back who could act as the leader of the defence. He packs a half decent long throw and is as dependable as they come. I signed him in October, and he completely transformed my defence. 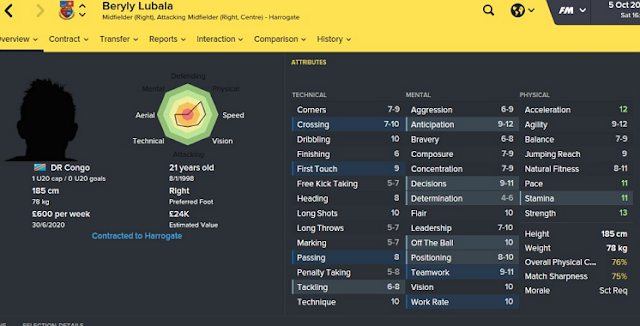 This left winger is everything you would want from a loan signing. He is available from Leicester City and appears happy to join at the start of the season no matter your predicted finishing position/reputation. If played as a left attacking midfielder he is capable of chipping in with 10+ goals, frequently ghosting in round the back to meet crosses from the right back with the ‘hit early crosses’ instruction. His technical ability isn’t as high as you might hope, but he has good natural fitness and defensive qualities and can be relied upon to track his fullback, while he is also a competent left back. Think James Milner but more prolific. The one that got away. Ah. 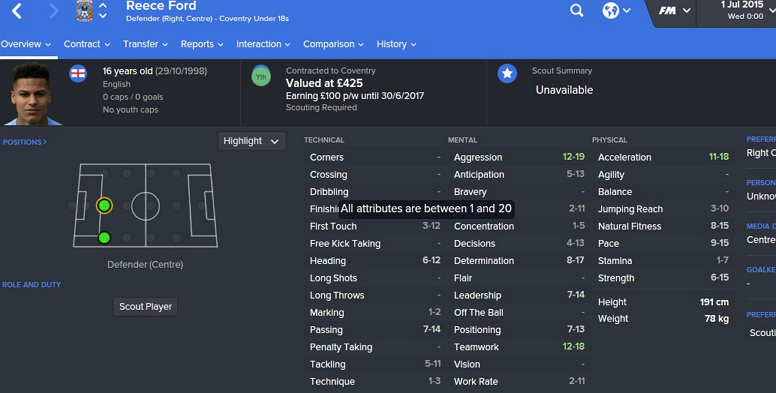 A striker at Mansfield who garners a poor scout report, which resulted in me opting to avoid him. A mistake I indeed came to rue, when he went on to score 22 goals in the league’s worst team, averaging better than a goal every other game in a team which was relegated. A pacey forward capable of playing the lone role while the rest of the team focuses on defending, he has good pace and can be deadly on the counter, while he is also a reliable finisher, who can be depended on to take the one chance that may fall your way. Interestingly, he went on to struggle back at his parent club in the Vanarama National, but a no-brainer in the short term. 22 goals in a team that got relegated is not too shabby - but a player my scouts deemed not good enough! Not dissimilarly to Michael Kelly, Lubala has the habit of drifting between the fullback and centre-half for simple finishes with the ‘hit early crosses’ option. 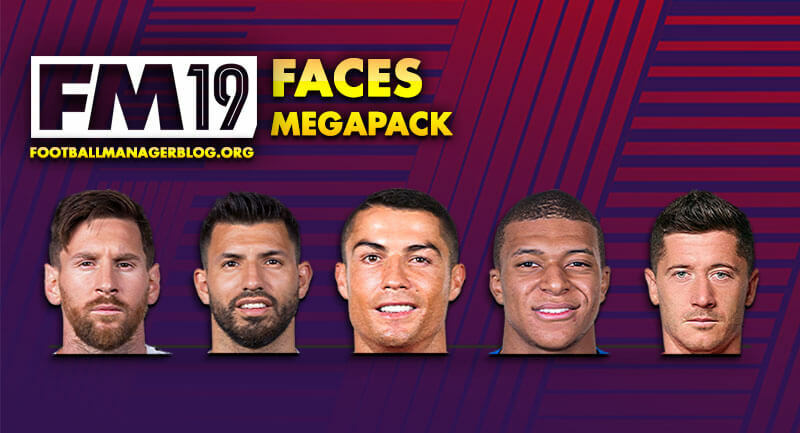 He is capable of getting at and beating his man with ease, strong acceleration and dribbling, and his final delivery culminated in a high volume of assists and chances created. It must be noted that he was reluctant to drop down to the Vanarama North, and he was unwilling to come back after we had lost the play-off final, but if you manage to lure him, he is a consistent threat. The player who springs to mind is Bakary Sako. The first of three sensational wingers I signed on loan during my first season with Nuneaton and on his day one of the most exciting and threatening. He’s quick and can terrorise fullbacks, while he is capable of delivering superb crosses. Of the three wingers featured on this list, he is the least reliable, regularly allowing games to pass him by, but on his day he was also the most dangerous. Unquestionably a risk worth taking, this player WILL create and score goals. 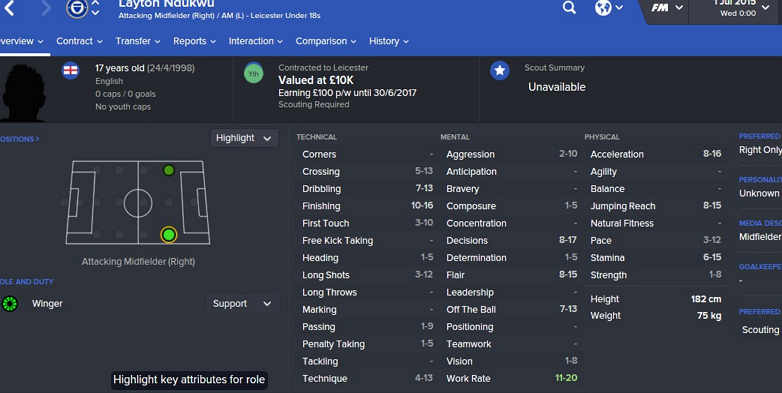 I had no problems getting him two seasons in a row from Leicester. A young attacking midfielder/striker available from Derby, this is a player who slipped through my net, instead of arriving at an almost single handily keeping up a relegation favourite. He has all of the key attributes I look for in a striker; finishing, composure, pace, acceleration and heading. While he is listed as a CAM, his flair, technique, passing and dribbling attributes are poor, and although I have never managed him, I think he could be a key asset if played through the middle and given quality service. 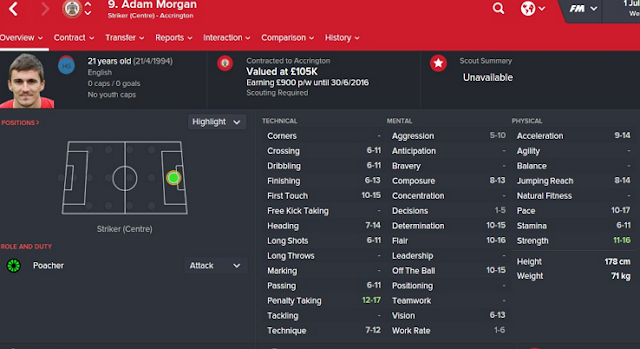 Vernam is listed as an AM - but do his attributes suggest he may make for a better striker? 30 goals in a season is an eye-opener, particularly when your side struggles to mid-table mediocrity. Pooni was used as a playmaker by Corby, playing as part of a front three with little defensive responsibility, allowing him to drift in and out of the game. He has bags of flair and can finish superbly. The first of four fine wingers on this list, Otim is a right winger who can also play through the middle. His attributes are solid if not spectacular, and his scout report is nothing to write home about, but his one season in the Vanarama North resulted in an incredible 17 goals from the right wing. He has pace and at this level is a good enough finisher to capitalise on the many chances the poor defending can offer. It must be noted that he is something of a liability defensively, and requires a solid right back behind him, who can be depended on to remain defensively disciplined and has a high skill level, for he will not be offered much help from Otim. Having said that, this signing should be a no-brainer. A player who may or may not be available, but one who must be snatched up if he is. This experienced striker starts the season at Accrington, but on my save did not feature for them, and at Christmas dropped down to the North on loan, where he duly tore the division to shreds for two months, before injury forced a premature end to his season. He is one of the most technically gifted players who can be reasonably expected to drop so far down the football pyramid, and this combined with a superb long shot led to several spectacular moments in his short stint in the league. He is a class above most of the players who appear at this level, and he can turn a game in a heartbeat, creating something out of nothing. There are question marks about his injury background on the game, as over a couple of seasons he builds up quite the list, but this is not something which you need to worry about with a loan signing – make sure you have the option to terminate his loan. 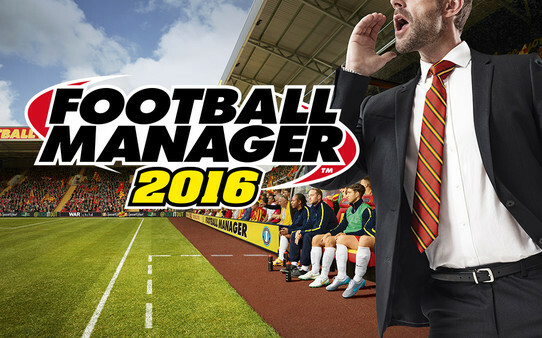 10 loan signings you simply MUST make in Football Manager 2016. 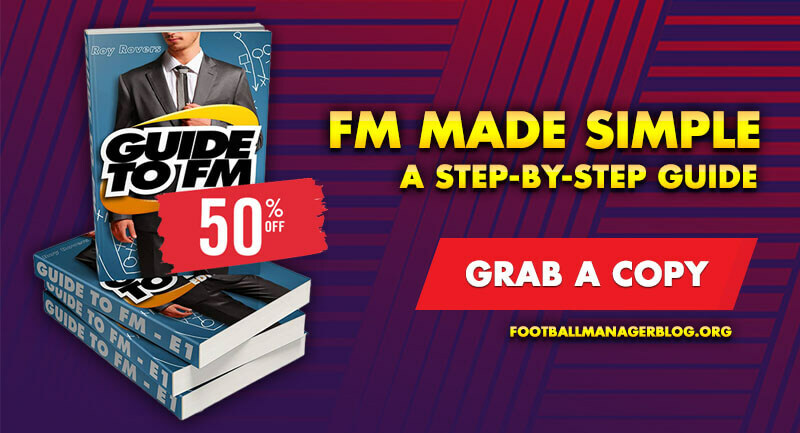 FM Guide brought to you by Ben Walsh.